Xenopus tadpoles: Photograph credit: David FreiheitIn 1949, Donald Olding Hebb, a psychologist at McGill University proposed this theory: "Cells that fire together, wire together. Cells that fire out of sink, lose their link." Sixty-five years later, neuroscientists from the same university, along with those from the Montreal Neurological Institute and Hospital, have finally seen the Hebbian Theory in real time, in real living creatures, in action, and in color. "For the first time we have direct, real-time evidence, from watching brain cells in an intact animal, to support Hebb's Model, but we also provide surprising new details fundamentally updating the model for the 21st century," said Dr. Edward Ruthazer, senior investigator of the study. 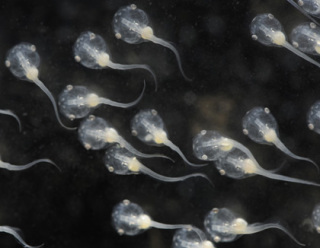 The researchers actually observed the action of neuronal cells in Xenopus tadpoles, a transparent species of tadpole. The animals were exposed to a variety of light patterns. At times the same patterns were exposed to each eye, and at times different patterns were presented to each eye. Using multiphoton laser-scanning microscopy to study exactly how the neurons fired, the investigators watched for the neuronal reactions when they fired the patterns in sync for each eye and when each eye received a different but simultaneous pattern. They observed that nerve cells responding to congruous stimulation formed a strong bond together, but nerve cells responding to asynchronous stimulation became destablized and withdrew their connections. Just like Hebb proposed! "The surprising and entirely unexpected finding is that even though nerve circuit remodeling from asynchonous stimulation actively weakens connections, there is a 60 percent increase in axon branches that are exploring the environment, but these exploratory branches are not long-lived," said Dr. Ruthazer. Ruthazer and his team are continuing their studies of the developmental neuronal workings of Xenopus tadpoles in the hopes of better understanding our own normal brain circuitry and that of those with neurodevelopmental disorders, such as schizophrenia and autism. For further information about the study, visit McGill University Channels. The complete research study is published in the journal Science.